And, given that temperatures are only set to rise over the coming months, now is the ideal time to prepare your home for Summer with an innovative solar shading solution. By stopping the sun's energy even reaching the glass, our External Roller Blinds can be fitted to glazing of all sizes and styles to prevent overheating to the indoor space, as demonstrated in our product video below. In fact, the Caribbean Blinds' team have just completed two External Roller Blind installations, ensuring both properties remain fully usable throughout the approaching Summer months. The first installation was to the South and East-facing glazing of this Cambridge penthouse apartment, effectively regulating solar heat and light to ensure a comfortable indoor space whilst maintaining the view outwards. Additionally, the hardware was carefully colour co-ordinated to match the cladding, ensuring the blinds blend seamlessly with the apartment for a sleek finish that's in keeping with the property's aesthetics. 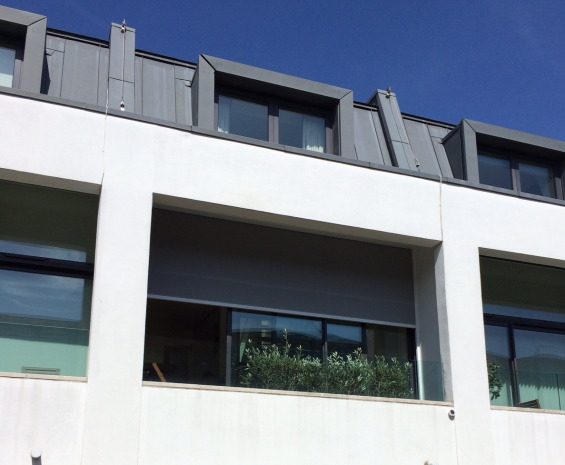 Our second External Roller Blind installation was to the front balcony of this Mews property. The blind was fitted to a double height window to prevent overheating and provide all-important privacy from the overlooking buildings. As you can see, the white hardware disappears with the white render and the pearl grey mesh fabric provides the perfect balance between heat and light regulation whilst maintaining the view through the fabric. If you would like to beat the Summer rush and find out more about our innovative External Roller Blinds, along with our full range of state-of-the-art solar shading solutions, fill in our enquiry form here, or chat to one of our dedicated specialists today on 0344 800 1947.